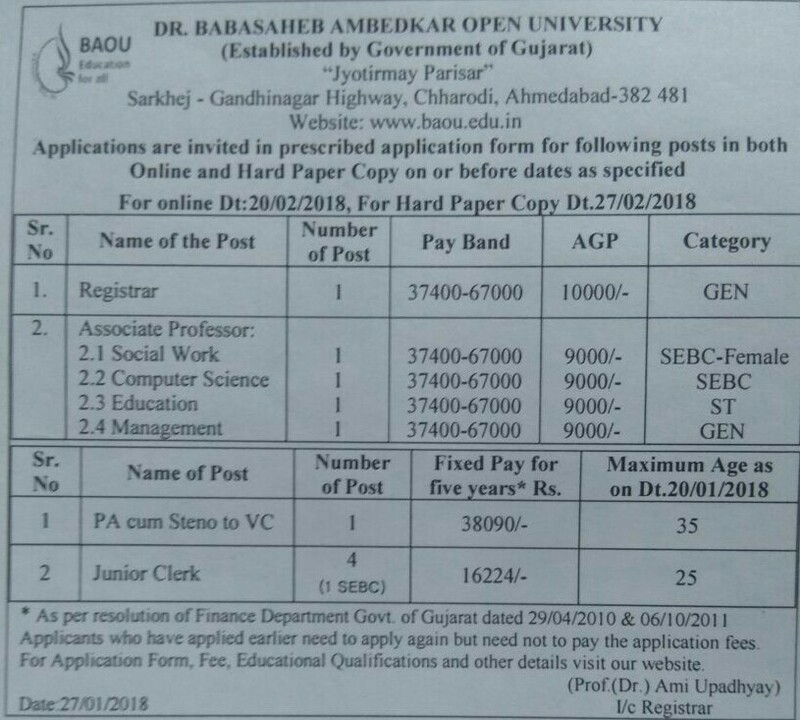 Dr. Babasaheb Ambedkar Open University (BAOU), Ahmedabad Recruitment for Teaching & Non Teaching Posts 2018. Age Limit: Candidates age should be 35 years for post-3, 25 years for post-4. Educational Qualification: Candidates should have Master Degree with at least 55% marks or its equivalent grade for post-1, Good Academic record with Ph.D degree in the concerned/ allied/ relevant disciplines, Master Degree with at least 55% marks for post-2, Bachelor degree from recognized university with 90 wpm shorthand, 40 wpm in typing writing in Gujarati for post-3, Bachelor degree from recognized university for post-4 and relevant experience. Application Fee: Candidates should pay Rs. 250/- for SC/ ST and PH candidate and Rs. 500/- for other candidates by the D.D in favor of Dr. Babasaheb Ambedkar Open University payable at Ahmedabad. How to Apply: Eligible candidates can apply online through the website www.baou.edu.in on or before 20-02-2018 & send their hard copy of application, Please write Application for the post of ——— on top of envelope by Registered Post AD/ Speed Post to the Registrar, Dr. Babasaheb Ambedkar Open University, Jyotirmay Parisar, Sarkhej Gandhinagar Highway,Chharodi, Ahmedabad – 382 481 on or before 27-02-2018. Last Date to Apply Online: 20/02/2018.